Pizza in my crockpot, you say? I have to admit when my sister told me about this recipe that she found in my grandma’s recipe box, I was a bit skeptical. But after seeing how good her crockpot macaroni and cheese recipe is, I decided to give it a try. Then I watched my six year old devour it, and I realized my grandma was really onto something. No, there is no crust to this pizza like a traditional one. 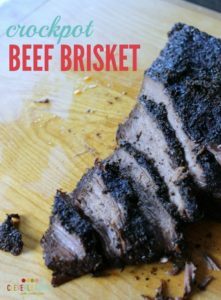 However, it’s built very similar and it’s super easy to make and that makes it a great family dinner night recipe for me! 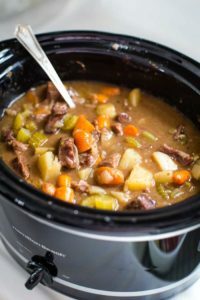 This is the crockpot I use and love! Let me just take a minute to talk about the pepperoni. I’m not the biggest fan of this kind of meat on my pizza. It usually makes a grease pool and the kick it gives leaves me with all sorts of heartburn. However, on a trip to visit my husband’s family I was introduced to turkey pepperoni of which – I questioned. 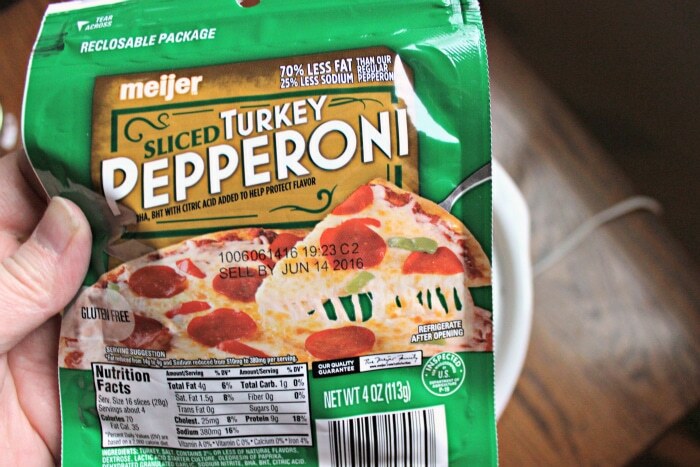 However, it has the same great taste as pepperoni without all the grease which makes it perfect for this recipe! You do not want a pool of grease in your crockpot, am I right? Boil your noodles according to the package directions. Layer them on the bottom of your crockpot. 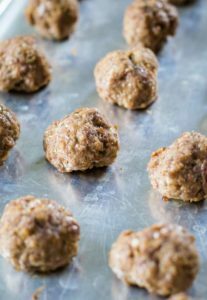 Cook your ground beef fully and drain it. Add it to the top of the noodles. Add the two cans of sauce. Add the cheese. Layer the top with your pepperoni! Cook on low for four hours and – it’s pizza time! And that’s it! The pizza layers itself and the result was a big hit with my family! If you like it more saucy, add more sauce. If you like it more cheesy, add more cheese. Customize it exactly like your pizza! Enjoy! 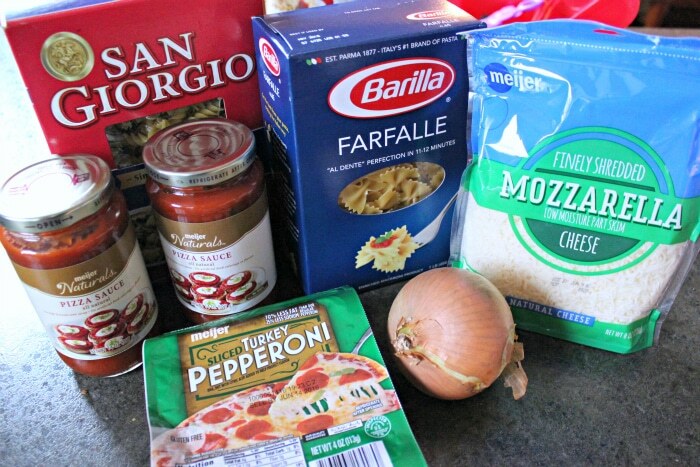 Crockpot pizza made with pasta. 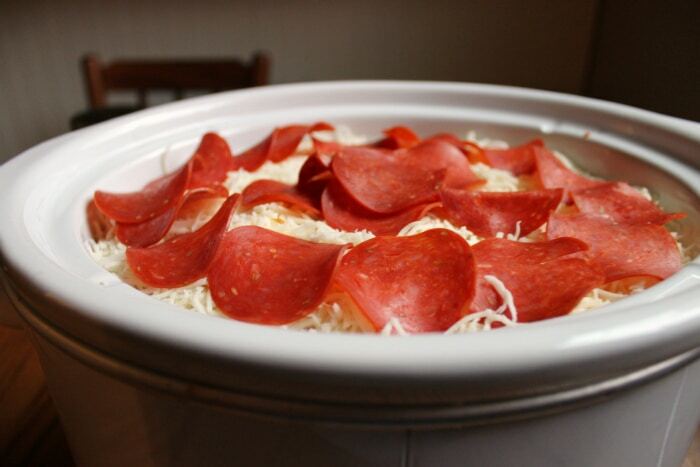 This slow cooker pizza is made with turkey pepperoni for a less greasy pizza alternative. Cook your pasta according to the directions. Drain. Cook the ground beef fully with the chopped onion and drain. 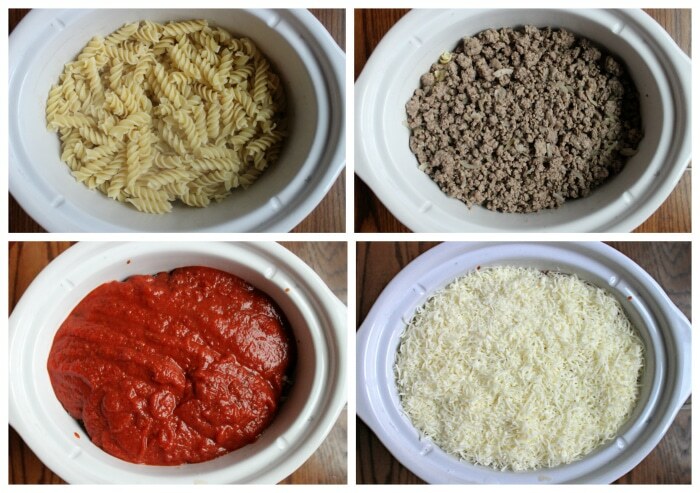 Add the cooked pasta to your crockpot. Layer the ground beef on top. Cook in the crockpot for four hours on low. I suggest using Turkey pepperoni as it’s less greasy. I didn’t see where you were suppose to add the onion or did I read it wrong? Hi Debbie, you add the onion to the ground beef while browning it to give it some extra flavor. 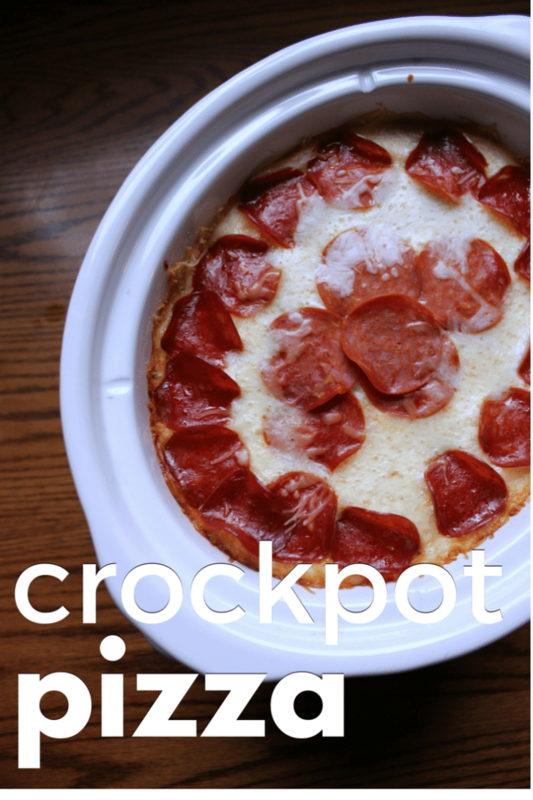 This looks realy yummy, I love crock pot recipes and I love pizza! Just came across this and I’m making it now. 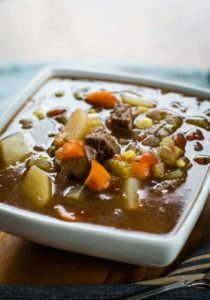 Could I speed up cooking process to 2 hours by cooking it on high in the crockpot? Love this! Great for the summer when it’s too hot to use the grill or oven. My family all loves it. What weight or volume is the pizza sauce, we don’t have cans of sauce here in Australia. It is hard to make many of the recipes when there is no metric volume. Hi Pauline, the pizza sauce is 14 oz per can. Hope that helps! You can use less or more depending on your taste.